Secure Logic has a solid track record delivering ICT transformation experiences and assisting organisations with meeting their innovation and transformation objectives. Among our customers are government agencies, leading universities, and financial organisations. Whenever it comes to digital service innovation, cost reduction, cloud adoption, or meeting your compliance needs, we bring our extensive industry experience to provide forward-thinking solutions to transform your organisation. Don't Know Where To Start With Your ICT Transformation Program? Secure Logic provides a safe and smooth migration and transformation to your new service model by systematically ensuring every detail is addressed. Our experience with complications including lack of documentation, stagnant data, unknown applications and inconsistent processes, have informed our methodology. Assessment: Detailed technical and operational assessment of your existing environment to ensure we understand your business, risks, and future plans. Strategy: Developing a business and user focused transformation strategy. Roadmap: Detailed roadmap will be developed based on the initial assessment, and program requirements. Architecture: Solution is designed using a top-down approach focusing on business outcomes, security, and risk management. Migration: Focus is placed on migrating your environment with minimal disruption to business operations. Compliance: Solutions are designed to minimise risks, and comply to national and international information security standards and guidelines. The IT industry is moving rapidly towards an era where infrastructure and business processes are brought together and delivered As-a-Service. Secure Logic’s focus is on business outcomes through delivering a scalable, consumption-based service, supported by 24×7 monitoring, cloud and automation services. Initiatives: How will this achieve business outcomes, and power initiatives? Risks: How will the solution minimise and manage risk? Purpose: Using a top-down approach and knowing what will be achieved at the end. Financials: Monitoring spend during the project, and demonstrating ROI. People: How will we improve the user experience? Scope: Considering both current and future requirements. We allocate dedicated experts with a range of technical, and project management experience to the program. We work onsite, and closely with your subject-matter experts to understand your business, and underlying supporting infrastructure. Emphasis is placed on training, documentation, and knowledge transfer to your teams in order to empower them with full understanding and control of the new operating model. At the same time, we work with you in establishing ongoing program and project governance to enable improved decision making, project execution, and accountability. We develop the processes and control mechanisms required for your project to become a success. 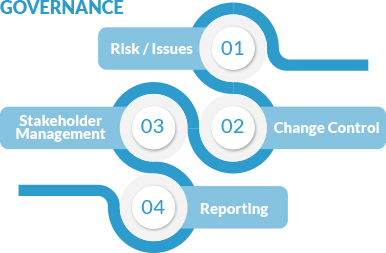 Risk management and governance are front-of-mind, and operational processes are designed to align with your risk appetite. Secure Logic follows international standards for enterprise risk management and information security management while delivering services to your organisation.